Chlorophyll has two spectral ranges of utilization - red and blue. 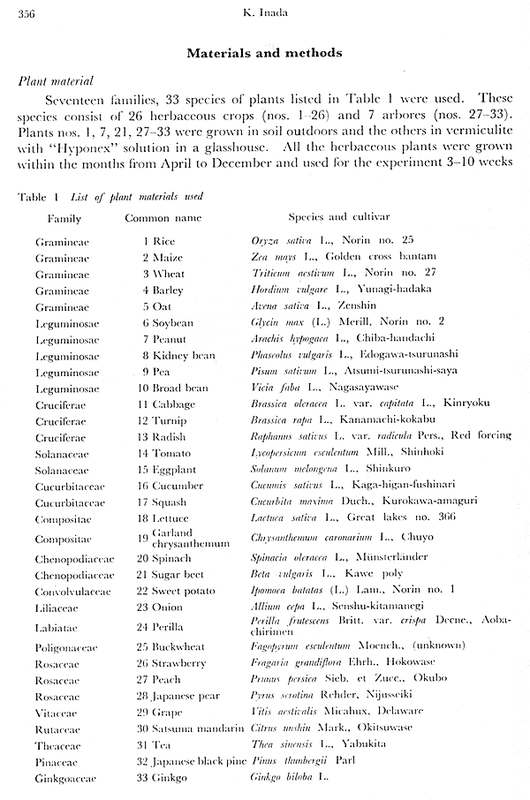 Plants also have two kinds of chlorophyll - A and B. Basic photosynthesis will proceed if even only one chlorophyll is utilizing light. Chlorophyll A is the basic one for making chemical energy from light energy. Chlorophyll B is the main "accessory pigment" in green algae and "higher plants", and serves to utilize light at wavelengths not absorbed well by Chlorophyll A and transfer the energy from such wavelengths to the process that uses Chlorophyll A. Other accessory pigments are mainly carotenoids, which mainly utilize blue and violet light. A Photosynthesis Page at the Maricopa Comunity Colleges. The same action spectra are also available here. The specific plant species chosen here appears to me to have spectral response peaks corresponding to those of Chlorophyll A, but has significant utilization of red wavelengths 625 to 680 nm and violet, blue and green-blue wavelengths 400 to 495 nm. 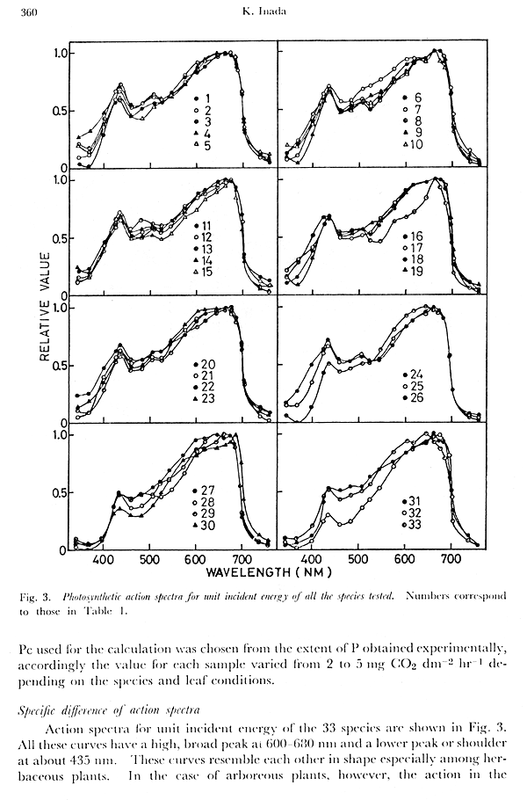 this bean plant photosynthesis action spectrum paper, specifically Fig. 7 on Page 4. This bean plant action spectrum has a red peak and a violet-blue peak at wavelengths similar to those of chlorophyll A. The red peak is hown to be around 665 nm and the blue peak is shown to be around 440 nm. Unlike many other published action spectra, the blue peak is not as great as the red peak. One more note 5/3/2010: The action curve is shown to be of a measure of photosynthetic action per photon, rather than per unit energy. To convert this to photosynthetic action per unit energy, this curve needs to be weighted by wavelength. That would make the blue peak having a value around 55-60% of that of the red peak. At 595 nm, photosyntetic action per unit energy/power of light is about 81% of peak. At 585 nm, this figure is 76% of peak. The "green minimum" is around 525-530 nm with photosynthetic action around 50% of peak. There is another minimum in the greenish blue around 475 nm, with photosynthetic action around 48% of peak. This would alter the curve to resemble most of the 33 photosyntetic spectral action curves linked below. These curves have peak wavelength anywhere from 645 to 690 nm in the red. The plant with the narrowest red peak had peak wavelength around 660 nm. 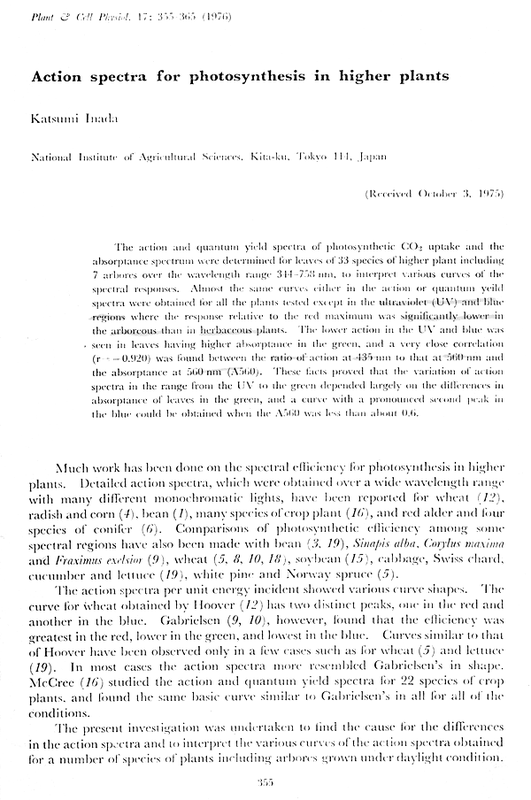 Most plants had photosynthetic action near or over 90% of peak at all wavelengths from 610 to 680 nm, and near or over 80% of peak from 590 to 685 nm. Photosynthetic action for most plants was around 22-30% of peak at 700 nm. For most of the 33 plants shown, photosynthetic action was down to about half of peak from about 450 nm to about 520 nm, and mostly in the 50-70% of peak range at a secondary peak around 435 nm. At 400 nm, depending on plant species, photosynthetic action was anywhere from less than 10% of peak to about 50% of peak. One more datapoint is that high pressure sodium lamps have been used for growing plants. The spectral content of those is mostly in the range from 580 to 620 nm, mid-yellow to orangish red. High pressure sodium lamps have a significant very yellowish green spectral emission feature around 568-569 nm, but that one is not as well utilized by plants as red and blue wavelengths are - that wavelength is mainly useful for usefulness to human photopic vision. Although stimulating only one photopigment is sufficient for photosynthesis, many plants have some requirement of stimulating more than one photopigment or at least one other than the red utilization of Chlorophyll A for proper growth regulation, flowering and fruiting. Proper growth regulation, flowering and fruiting often requires significant blue light. Most published spectral action curves do not show well actual utilization, and a few show well ratio of absorption to transmission. Fewer still show ratio of light utilized to light not utilized. If these curves are redrawn to show ratio of light utilized (or absorbed) to incident light, the peaks often become wider and flattened compared to most published "action spectrum" curves. Many of these curves are also inaccurate, showing the peaks as more symmetric than they actually are. The peaks are asymmetric, with wavelengths shorter than peak being used better than wavelengths longer than peak. The red region has a utilization peak around 660-670 nm for Chlorophyll A and around 635-645 nm for Chlorophyll B, depending on the source of information. Plants generally make good use of all red wavelengths except for ones much longer than 670 nm. 700 nm and longer is close to useless for plants. Most plants actually make good use of orange and even yellow-orange wavelengths, to such an extent that high pressure sodium lamps have been used for growing plants. Keep in mind the above-cited bean plant "action spectrum". The blue utilization peaks of chlorophyll are mostly reported to be around 430-440 nm for Chlorophyll A and around 453-470 nm for Chlorophyll B. Unlike the red peaks, the blue peaks are usually shown with substantial asymmetry indicating that wavelengths shorter than peak are used well while wavelengths longer than peak are not used well. Beta carotene is a major blue-absorbing accessory pigment, with a double peak at about 450 and 480 nm. This page at Wisconsin Center for Space Automation and Robotics describes a plant growth unit illuminated by 670 nm red and 470 nm blue LEDs. Illumination intensity is adjustable, with maximum values (my translation to watts of light per square meter) of about 98 watts per square meter for red and about 18 watts per square meter for blue. If you need to get by on much less than this, I would make these figures more equal in case your plants have specific blue light requirements that need to be satisfied. I suspect plants that do not have especially high needs can fare reasonably well with 25 watts per square meter of red and 9 watts per square meter of blue. Another data point for amount of light needed is the above-mentioned bean plant paper. It mentions use for part of the experiment of a fluorescent lamp with spectral power distribution shown in Fig. 1, with illumination intensity anywhere from 1200 to 1750 footcandles, which is 12,910 to 18,830 lux. My personal "eyeball estimate" of lumens per radiated watt from that spectral power distribution is a little more than that of equal energy per unit wavelength 400-700 nm only, so I estimate 240 lumens per radiated watt. The spectrum also appears to me somewhat like that of a "natural" fluorescent lamp, producing 69% as much light as a "standard cool white" in the case of 40 watt F40T12 fluorescent lamps. I had a cool white one spectrum-analyzed to have 350 lumens per watt radiated in the 380-780 nm range. 69% of that is 241.5 lumens/watt, but with the more reddish "Natural" the Stokes loss is higher, so I would want to say 245-250 lumens per radiated watt. At this rate, 12,910 to 18,830 lux is 51.6 to 76.9 watts per square meter. The fluorescent "grow", "gro", "Gro-Lux" and "Plant and Aquarium" fluorescents by GE and Sylvania are fairly optimized for this. The "similar" Philips lamps appear to me to be different but only slightly worse (from having some significant though minority phosphor content at less-utilized green wavelengths). Keep in mind that plants and human vision have different spectral response, so brightness of a lamp as it appears to humans easily fails to correlate well with usefulness to plants. 660 nm LEDs match the Chlorophyll A red peak well, and efficient high power 660 nm LEDs are now available. The shorter wavelength red is almost as effective as the longer wavelength for growing most plants. The shorter wavelength ones also tend to be more widely available and slightly more efficient. However, the longer wavelength tends to be less adversely affected by elevated heatsink temperatures around 35-70 degrees C.
For specific LEDs and red/blue ratios, go to the plant growing section of my LED FAQ. Keep in mind that the most suitable LEDs mentioned in the above link are typically about 50% efficient when the junction temperature is 25 degrees C.
Keep in mind that plant-growing fluorescents are about 30% efficient at producing desirable wavelengths of light for F32T8, 25% efficient for F40T12, and 20% efficient for the F20T12. I mention a bit in my LED FAQ Page, Plant Growing Section. Copyright (C) Donald L. Klipstein 2008, 2010, 2011, 2012. Please read my Copyright and authorship info.